This is the reason why well run webinars regularly see conversion rates in the high double digits: see this case study where two webinars and a list under 100 people generated $17k in sales. Webinars are regularly conducted by startups like Hubspot, Intercom, Mixpanel etc to acquire users and familiarizer them with the product so that the churn rate stays low. And in case you need some more validation, even an old-school company like IBM has a dedicated webinar portal. But odds are, you aren’t doing webinars. Or you may have tried it once, and it didn’t go as planned. 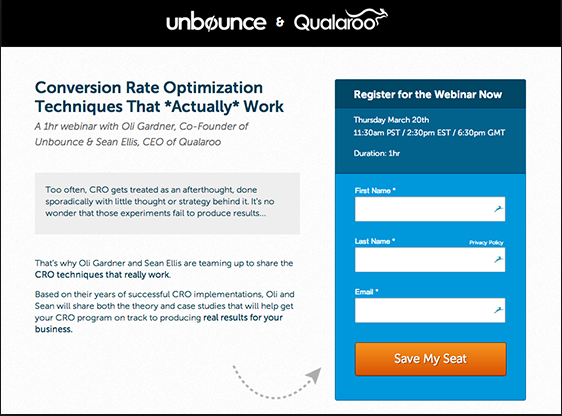 While webinars are high converting they are also hard to pull off. With so many moving parts organizing them isn’t as simple as hitting the publish button on a blog post. The pre-webinar phase: This phase includes tasks like creating an offer, driving traffic to the registration page, optimizing the registration page for high conversions, warming up the audience for the topic, and maximizing attendance rates. The webinar phase: The actual webinar. Structuring your content, bounce proofing your webinar, making sure technology works fine, pitching your offer right, making it easy for people to complete the CTA are the things you need to do here. Post-webinar phase; Following up with your audience, editing and sending a replay, selling your offer again, giving people more options to engage with you, are some of the things smart marketers do to get the best bang out of their webinar bucks. The familiarity of the audience with your product. The awareness level of your audience about the problems you seek to address. Date and time of the webinar (bad idea to set up the webinar at one in the morning EST if your audience is mostly based in the US). Webinar software is not the most well designed and anyone who has done webinars has at least found themselves at the wrong end of snapped internet connections, inaudible sounds, crashed operating systems, frozen browsers or a myriad of other problems. I have sat through a whole bunch of webinars where the host had to apologize because the audio feed from the guest presenter faded out, or the slides just stopped moving. Just because someone confirmed that they would attend the webinar doesn’t mean that they will show up when it actually starts. They might be otherwise occupied, they might forget or they might prefer to watch Game of Thrones over attending your webinar. Anecdotal evidence suggests that almost half of webinar visitors won’t show up unless you do a good job of warming them up, and selling them on the value of your content. When that happens, you have straight up lost half of potential sales. Webinars are also notorious for high dropout rates. Most webinars run from 30 minutes to one hour or even more and unless the content is packaged and presented in an engaging fashion people will start tuning out. If you flub your delivery you will have to battle for attention with Facebook notifications, texts from friends, an urgent email from the boss, or a phone call from the spouse. If you talk down to your audience and do not engage in a dialog you will almost always lose these battles, and the number of potential clicks would fall further. Want to know how to deploy that ace? Here’s a list of 18 things pros do to increase the ROI of their webinars and laugh all the way to the bank. These tips, strategies, and hacks are divided by the three stages of a typical webinar lifecycle. Test these hacks for your next webinar. (click to jump to a specific hack). Most people drive traffic to the webinar registration page through a blog post or through an email to their mailing list. But what if you don’t have enough traffic to your post or have a tiny email list? Try Facebook ads. Depending on your budget and the ad copy you will have to allocate some ad spend but if your offer has already been tested with the right audience these ads will draw in more people than you could have hoped to reach using organic methods. If you want to get nearly the same results with even lower costs check out #2. If you are seeing low conversion rates through Facebook ads to a webinar then offer users a lead magnet that’s related to the topic covered by the webinar. The ad for the lead magnet would have a higher conversion rate, mainly because downloading a PDF is way less of a commitment than spending 60 minutes listening to a webinar. Pitch the webinar on the Thank You page after the viewer has downloaded the lead magnet. For example, if your webinar is about help desk software, make your lead magnet something like “10 customer email templates for a help desk that delights users”, and offer your webinar as an upsell to the lead magnet which will show viewers how to run a high performing help desk. Sometimes, people who have landed on the webinar registration page might not sign up immediately. For this cohort, run a retargeting campaign to nudge them towards signing up. For people who have landed on your registration page through email but haven’t signed up, you can also use automation features offered by most email marketing software to segment them into a separate list and follow up with a gentle reminder. Inconsistency between ads/email and the headline of the registration page will cause people to immediately bounce off. Have benefits focused headline, subheading and body copy. Put headshots of the presenters along with their bio. Add important information like data and time. 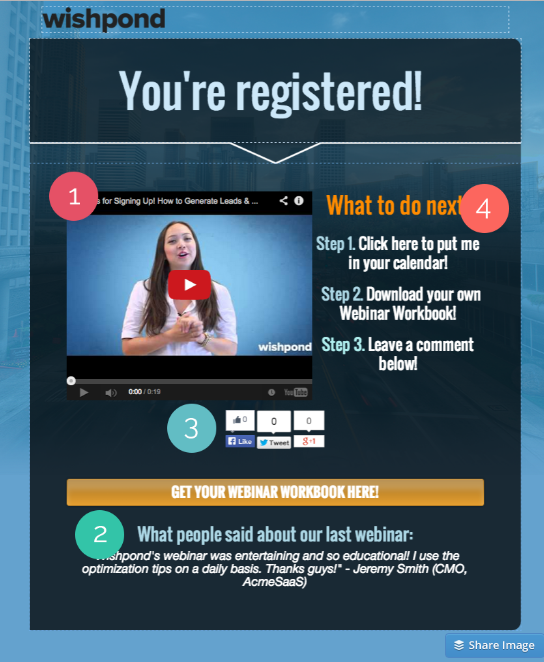 Here’s an example of a webinar registration page done right. A number of smart marketers ask for phone numbers so that attendees can get a text just before the webinar goes live. This tactic can work great to boost webinar attendance rates if your audience already trusts you. 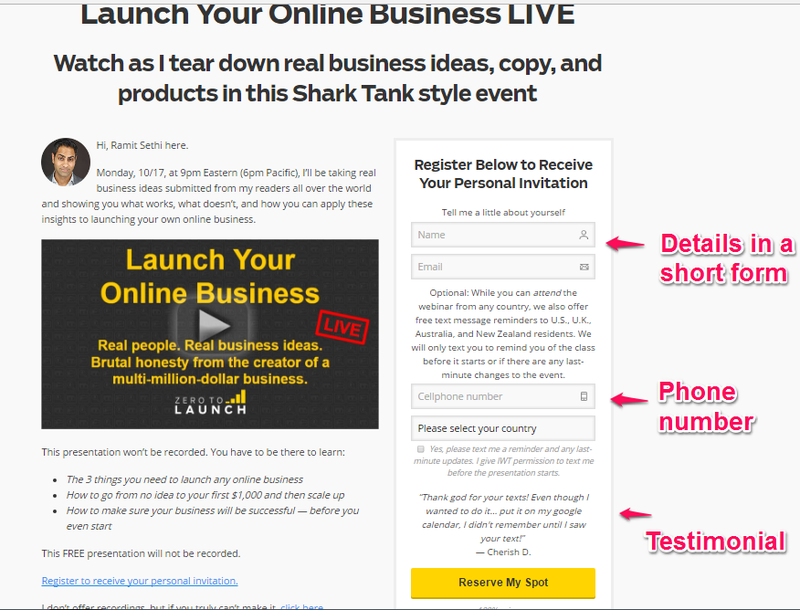 Here’s how Ramit Sethi from IWT uses this hack to great effect on a webinar registration page. Important: If you use the phone tactic, explicitly ask for permission to use the number to send the texts pertaining to the webinar only, and for nothing else. Not doing so can open you up to huge fines in many jurisdictions. Once the attendee has clicked on the call to action , they should be taken to a Thank You page where you can further guarantee the increase in show up and attendance rates by offering a printable worksheet. Such worksheets are valuable for viewers to work through the material that you will teach, makes them internalize your content, and also keeps them engaged. Bonus tip #1: Shoot a short video of yourself talking about what’s going to be covered in the webinar. Lay out a few bullet points, give the benefits, and end. Bonust tip #2: Give users the option to add the time in their calendars. Typically links to Google Calendar, Outlook, and iCal are sufficient. Here’s a great example of a well-designed webinar thank you page. As you can see, this page gives attendees more options to interact, by sharing the page on social media (and generating more sign-ups) or giving them an option of adding a comment (which could be used to tweak the webinar content). A lead nurturing campaign is extremely important for getting your attendees excited. This campaign should be a series of emails, filled with educational content that teaches something that you will cover in depth at the webinar. Don’t give away the farm in these emails. Give enough information so that readers get an inkling of the value that you provide. Tell customer success stories if you want. Give the what and why of your product without giving away the how. This nurture sequence should have open loops, where one email raises a question or ends in a cliffhanger that’s answered or resolved in the next. This tactic is used by Hollywood, your favorite TV shows or any by half decent novelist. Bonus tip: Invite attendees to send in questions in each of these emails (use a P.S.) and tell them that you would pick a few interesting questions during the webinar. Don’t neglect to send notification emails on the day of the webinar. Typically, you should send one about 12 hours before the webinar starts, one an hour before, and the “last call” email about 15 minutes from H-Hour. You can set up these emails in any webinar software. Don’t fret about sending too many notification emails. Your viewers have already expressed interest in attending, and it would be a shame if they missed the high quality content you are about to teach. Conversion Rate Experts runs several webinars throughout the year and they have a 68 point checklist for ensuring that their webinars go without a hitch. Setting up and testing the systems. Muting notifications, switching off backups and Dropbox syncs, and clearing browser history. Doing a full dress rehearsal a day before the webinar. Printing out and annotating the slides in case Powerpoint crashes. Using another laptop to log in as an attendee so that they can see what the attendees are watching. Read that post to prepare yourself better for the next webinar. One of the best ways to boost attendance at webinars is to announce valuable gifts for people who stick around till the very end. In the warm up email sequence mention the gift you will be sending and outline why it is so desirable. Make sure that the gift is something that complements the content of your webinar. Here’s an example: Russell Brunson of ClickFunnels, a marketing automation platform, announced that he would be dropping a sign-up link at some point in the webinar that I attended. The first 50 people who signed up through that link would get the enterprise plan at the price of the starter plan for one year. When the link finally came up I didn’t click on it because I wasn’t in the market for the solution. But 5 minutes later Russell announced that all 50 spots were taken! A number of attendees won’t still show up despite your nurturing sequence and notification emails. But don’t lose hope. 10-15 minutes into the webinar, while you are still doing the intros and the small talk send out an email/text or both to the attendees who haven’t turned up yet. Use “Webinar has just started” as part of your subject line. Make sure to mention that you are still doing the initial introductions and the tests and there’s still time to jump in before the actual teaching starts. If you see familiar names (maybe your best clients are also attending) greet them: this is something good speakers do when they are up on the stage, and it creates a friendly party vibe. At various points during the webinar, keep answering the questions that you have received through the warm up email sequence (see #7 above). Mention the slide you are on and point out something on the slide to get the attention of those attendees who might be checking out their phones or looking at some other tab. Run short polls, or ask viewers to send an emoji through the chat box. Ask people to type questions and comments about the material you are presenting in real time. Use a “low-high-low-high” structure for your content. All great speeches, from Lincoln’s Gettysburg address to Martin Luther’s “I have a dream” speech follow this structure. The audience goes through an emotional roller coaster ride and in your script it can take the form of problem-solution-problem-solution structure. Open with problems that the audience is familiar with. Break it down into about 3-5 component parts, twist the knife and articulate the negative consequences. And then, one by one, answer the five pain points, taking care to connect one with the other. (another variation of open and nested loops). Show attendees what they can achieve if they use your product/process. Paint a pretty picture, in vivid terms of the best case scenario (Warning: Don’t overpromise. The best case scenario has to exist in real life). Show them a transformation. Use the questions asked by participants to tweak your slides (give a hat tip to people whose questions prompted the changes and take advantage of the Ikea effect). Keep the jargon to a minimum. Despite your best efforts people will not pay 100% attention. Dumb it down as much as you can without losing the essence of your content. 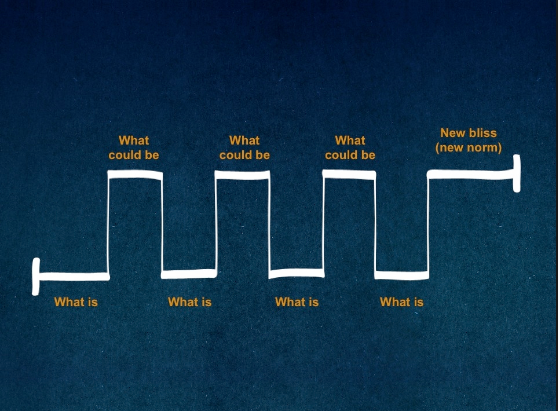 Most webinars follow this content structure. The good stuff comes at the beginning, with the pain points and the free high-value content. 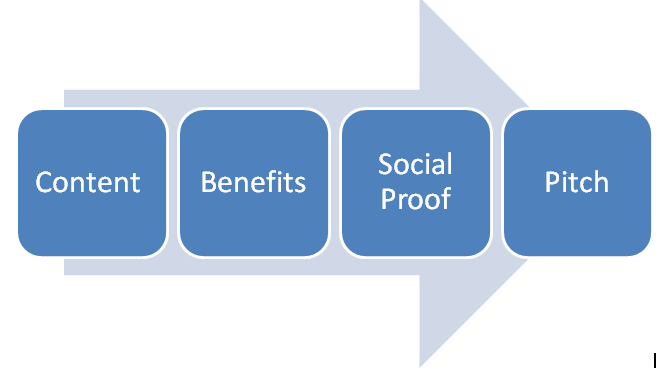 After that’s done, the presenter segues to the benefits of the product, offers social proof and then hits the attendees with the offer. What’s there to prevent them from tuning out after the free content has been delivered, and letting the rest of the webinar play in another tab until the juicy freebie for live attendees is announced? If you think about it for a bit, it’s almost like stacking the ads at the end of a Game of Thrones episode after the credits have rolled. Instead, there are multiple commercial breaks in the episode, most of them immediately following mini cliffhangers so that the chances of viewers watching the ads increases. You sell more without being pushy, salesy, or aggressive. The audience is more engaged and receptive to your pitch. Your pitch passes the sniff test and doesn’t feel like it’s tacked on. A webinar doesn’t stop giving gifts after it has ended. If the subject is relevant a webinar can run over and over again and be an important part of your acquisition, activation or retention funnels. But even with a one-time webinar, plenty of action happens after everyone has disconnected. There will be attendees who bailed out at the beginning of your webinar. To get them to consume the content send a specially crafted email inviting them to watch the replay. If the math adds up, you can also run Facebook retargeting ads promoting the replay. Unless you have specifically mentioned that no replays will be made available (this can boost attendance rates), make the replay available within 24 hours. You might have to edit the replay to make it more viewer friendly, especially if there were any interruptions. The replay videos are usually available for upto 72 hours. With a lot of webinars the money is in the followup. A lot of your attendees need more time to mull over your offer. The follow-up sequence highlights the benefits of your offer, and more importantly the losses attendees might suffer if there’s a delay. Depending on the price points it usually takes about 3-4 follow-up emails before you close the cart. Not everyone would want to watch the video replays. Some prefer simply listening to the recording on the phone while others might want to view the slides along with the notes. Offer both these formats as downloadable items in the follow-up sequence mentioned in #17. For attendees who have already clicked on the offer, send them the mp3 and the PDF along with the webinar replay email. The webinar type that I have talked about here deals with customer acquisition. 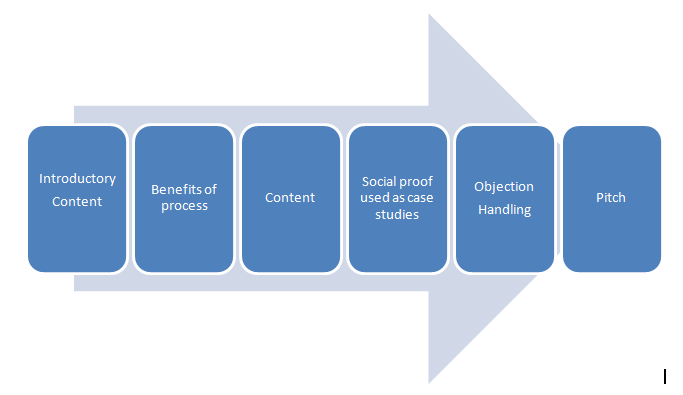 Some of the steps would change for a training webinar that’s designed for onboarding or training new users, primarily in the pre and the post-webinar phase, especially in the nurture sequence. If you are selling to enterprises, make training webinars a part of your contract. Enterprises budget for them, and the costs are typically 15-20% of the contract value. Pulling off a great webinar would help in onboarding enterprises and keeping these high-ticket clients happy. And that’s one more reason why you should up your webinar game.